SAN FRANCISCO (AP) Two days after returning from the paternity list, Brandon Crawford’s sleep pattern is slowly getting back to normal. His swing is looking smooth, too. Crawford doubled twice, tripled and drove in three runs, leading the San Francisco Giants over the San Diego Padres 5-3 on Saturday. The breakout game came less than a week after Crawford’s wife gave birth to the couple’s fourth child, son Bryson. Crawford went into the game mired in an 0-for-18 funk. He walked in the second inning, hit a triple off Matt Strahm in the fourth and doubled in a pair of runs off Adam Cimber (3-4) in the sixth. Crawford also doubled and scored in the eighth. San Francisco’s Gold Glove-winning shortstop also helped turn three of the Giants’ four double plays. He made a throwing error in the ninth that allowed a run to score. 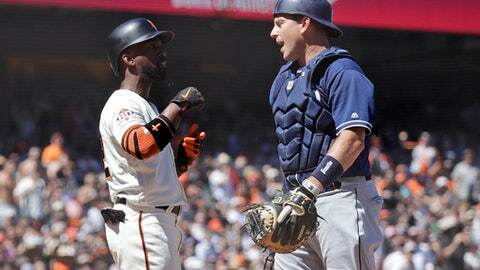 Crawford was bothered as much by the error as he was excited about breaking out of his batting slump. Reyes Moronta (3-1) retired three batters. Hunter Renfroe homered for San Diego. The Padres have dropped six of seven. San Diego manager Andy Green was forced to scramble after starting pitcher Jordan Lyles was scratched from the lineup with right forearm tightness minutes before he was scheduled to take the mound in the bottom of the first. Strahm, who started last Sunday in Atlanta, replaced Lyles and pitched into the fourth inning. Strahm gave up two hits and left after yielding Crawford’s RBI triple. Cimber, the fourth San Diego pitcher, allowed both runs in the sixth. Hernandez doubled in Nick Hundley in the seventh to make it 4-1. Giants starter Andrew Suarez gave up one run in 5 2/3 innings. Things got a little chippy in the seventh when Andrew McCutchen was hit by a pitch from San Diego reliever Phil Maton. McCutchen took exception after the previous pitch was high and inside, and he glared at Maton for several moments. Padres A.J. Ellis stepped in front of McCutchen and spoke to the hitter briefly before McCutchen walked to first base. Earlier in the week, the Giants and Miami Marlins exchanged allegations of beanballs during their three-game series at AT&T Park. The Giants optioned left fielder Mac Williamson to Triple-A Sacramento. Williamson was one of San Francisco’s hottest hitters before suffering a concussion in late April but has struggled at the plate since returning. Austin Slater was recalled and will join a crowded depth chart in left. Alen Hanson started Saturday, with Hunter Pence and Austin Jackson also in the mix. Giants: RHP Johnny Cueto (elbow inflammation) was scheduled make his first rehab start with Sacramento on Saturday night. … RHP Jeff Samardzija (shoulder tightness) will join Cueto in Sacramento and will throw around 90 pitches in a rehab start Tuesday. Giants RHP Dereck Rodriguez (2-1, 4.56 ERA) makes his third home start since joining the rotation. Rodriguez is unbeaten in his two previous starts at AT&T Park while allowing four runs in 11 innings. Eric Lauer (3-4, 5.47) pitches for the Padres. The left-hander has yielded three earned runs or fewer in his previous four starts.